096016 Shaker Heart in Hand on cord  - $20.00 : Red Bird Mission Crafts, Hand crafted art. 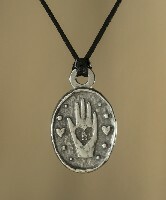 This approximate 1.25" x 1" oval medium medallion with a Shakers Heart in Hand is handcrafted of lead free pewter and on an approximately 36" satin cord. The image symbolizes on of the foremost Shaker beliefs: "Hands to work - Hearts to God" Everything the Shakers did with their hands was given the same intent and focus as prayer. The extraordinary beauty and spirit of their objects proves what an effective motto this was.